Richard Bornat is a professor at Middlesex University specializing in formal logic. He is the main force behind the Jape formal logic software. Remarkably, we can predict success or failure even before students have had any contact with any programming language, and with total accuracy. We present statistical analyses to prove the latter point. We speculate that programming teaching is therefore ineffective for those who are bound to fail and pointless for those who are bound to succeed. Richard Bornat. 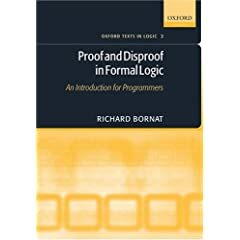 Proof and Disproof in Formal Logic: An Introduction for Programmers. Oxford: Oxford University Press, 2005. His Middlesex University staff profile lists more publications, and some of his papers may be downloaded from Scientific Commons. Many of his Jape writings are available from jape.org.uk.